I LOVE Sarah Dessen books, and her newest book Saint Anything is one of her best. Is there anything better to read on a sunny day than one of Sarah’s books?! They are the perfect beach read. Recently, Publisher’s Weekly asked booksellers questions about the upcoming summer and how it was shaping up for bookstores across the country and I, of course, gushed about Saint Anything. Check out the entire article here! 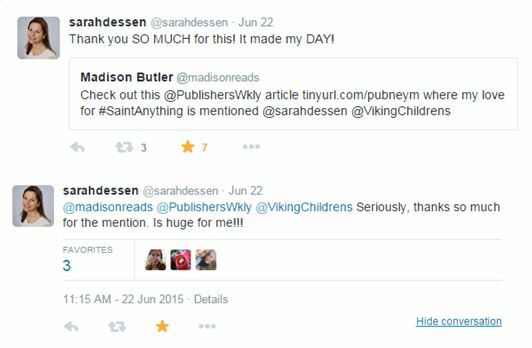 BUT the exciting part (no offence to Publishers Weekly…haha) was when I tweeted the link to the article and Sarah promptly replied that I made her day…and then replied a second time thanking me and Pub Weekly for the mention! Total nerdy fan girl moment…it happens. (Thanks Sarah!) Also, I dare you to read Saint Anything and not be totally craving pizza, french fries and dum dums by the time you get to the end.